Filipino culture can be a bit unnerving. There are things Filipinos eat that I don’t want to mention except I will mention one of them. There are Filipinos who participate in things like chicken fighting. Now, I’m not sure if this is true, but I was told the term buk buk, which refers to a Filipino, comes from the sound that chickens make. As a non-Filipino, there are things I don’t understand and don’t know and maybe that’s a good thing. But there are things I really respect about Filipino culture too. Recently, someone remarked to me that he didn’t know what was good about Filipino culture. So I told him about a Filipino coworker who had a lot of folk wisdom about health. For instance, when he got a cut, he would notice how it was healing. If it wasn’t healing quickly, it meant he had too much sugar in his body, and he would avoid sugar until it healed. This was the first time I had ever heard anything like this. This same coworker told me that when Filipino men hit their 50s, they eat mainly vegetables and much less meat. Maybe it’s a generalization to say that all Filipinos have that body awareness, but I was pretty impressed. Filipinos are also hard-working, friendly, and very family-oriented. A hardworking Filipino will send money back to his/her family back home, and then try to bring more family members over, so they can also help support the rest of the family. Most of the vendors at farmer’s markets, especially in Kahului or Wailuku, are Filipino. The sound of Ilocano or Tagalog, two main Filipino languages, is part of the soundscape at the farmer’s market. They are very involved with agriculture and gardening. Some local comedians like Frank De Lima or Andy Bumatai make great fun of all the ethnicities in Hawaii, including the Filipinos. Culturally, Filipinos are teased for wearing bright colors that may not match. Sometimes my husband will tease me for wearing certain color combinations, like a bright green bag with a purple top and jeans… When I told the ladies at the farmer’s market that day that he accused me of dressing like a Filipino, they laughed and said, no, I didn’t look Filipino enough - I needed to wear some golden heels. They did like the green bag with the purple top though. The other cultural belief about Filipino women is that one doesn’t dare fool around with them. Any husband found cheating should beware of going to bed, since his wife is probably sharpening her knife, and not for cutting vegetables. This past Saturday, there was a Filipino American Heritage Festival organized by the Filipino Chamber of Commerce at the Maui Mall in Kahului. One of the entertainment highlights was the Speedy Balut Eating Contest. If you’ve lived in Hawaii long enough, you’ll know what balut is and will probably avoid it. If you don’t know what balut is, then it’s something you should at least know what it is, so that you have the choice to avoid it. Balut.. hmmm… It’s a food that separates Filipinos and brave food eaters from the rest of us wimps. I grew up thinking it was kind of like a 1000 year old egg, fermented underground for hundreds of years, but it’s more prosaic. It is an egg, with an embryo of a chick, that has been boiled. Usually it’s a duck egg, but often it is a chicken egg. When cracked, there is a little chick inside with feathers and a beak. I really wanted to see the speedy balut eating contest. It’s such a controversial food, and I grew up hearing about it, but had never seen anyone actually eat balut. My husband had the fortune or misfortune to eat balut once at a Filipino wedding, and he has never recovered from it. Needless to say, he did resist going to the contest with me, but gave in, since I cited cultural reasons for going, mainly this blog. The announcer was a radio personality named Makani. I’ve never heard him before, and he was quite entertaining. The crowd really “egged him on” (yes, bad pun) to eat the first balut. He was armed with salt and a bottle of water… and hemmed and hawed but finally gave in to the crowd. Watching the scene as an outsider, I realized how much balut eating defines those who are Filipino from those who are not. It’s like a rite of passage for Filipino-ness. I did take some video footage, and it's not graphic, meaning there are no close-ups of the balut, so don't be afraid to watch it. I think it's actually kind of funny, watching the announcer interact with the crowd. There was even a certain manner in which balut is eaten… not just swallowed whole, but to be (eek) savored.. the shell cracked open and the liquid inside sucked out, and then eaten, feathers, and beak and bones and all. It’s a food the Klingons from Star Trek would be inspired to eat. I did not feel inspired to eat any however.. so balut eating will remain on my “one day I’ll have to try that before I die” list. The contest's first age category was for age 49 and older, and the contestants who had obviously registered ahead of time performed well under pressure. The second age category from 26 to 49 was asked, because of their youthful age, to speed eat two balut eggs, not just one. There was a controversy at the end because the winning contestant actually had not eaten all the pieces of balut on his plate, and so the prize went to the runner up. For the next age category, no one had registered ahead of time, and the host was calling for anyone to enter the contest. At that point, we high-tailed it and ran off because we didn't want to take any chances of getting "persuaded" to eat balut. Later that evening, we were at a supermarket check out line, and mentioned the balut eating contest to the Filipino cashier. She got so distracted thinking about the contest that she got mixed up with the items and the receipt. I guess that’s what balut can do to people. To see graphic pictures and a detailed description of balut, definitely not for the faint-hearted, visit this balut site. 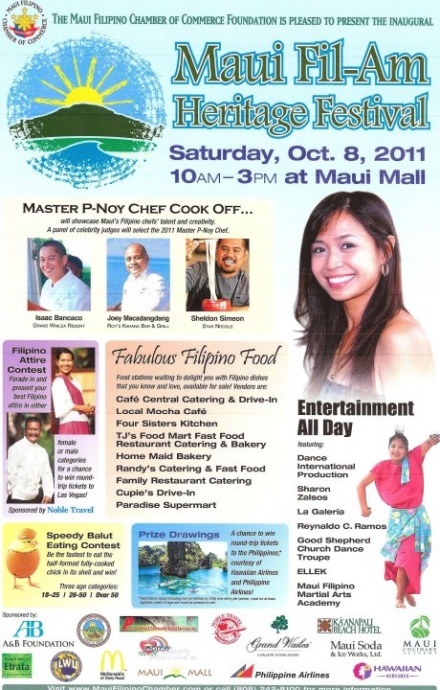 For a Filipino perspective on Filipino-ness, read Maui Time's write-up on Fil-Am Heritage Day .